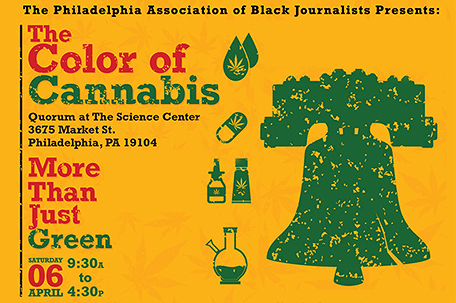 The Philadelphia Association of Black Journalists (PABJ) will assemble more than 100 journalists, legislators, patients, and community community leaders for “More than Just Green: The Color of Cannabis,” an educational engagement conference starting at 9:30 a.m. on Saturday, April 6, 2019 at Quorum at the Science Center, 3675 Market Street, Philadelphia, PA 19104. The event will continue to reverse the stigmatization and misinformation on cannabis, which has plagued communities of color for generations, and underscore the importance of why media, medical, legislative and community-based professionals need to be more aware, informed and involved in legalization discussions developing right now in our state. Tauhid Chappell, a medical marijuana patient and PABJ secretary, has gathered experts from around the country to underline the importance of this event. A growing list of confirmed panelists include: PA State Reps. Jordan Harris and Chris Rabb, first assistant district attorney to Larry Krasner and former Obama DOJ appointee Robert Listenbee, and K. Foxx from the Quincy Harris Morning show. A limited amount of public tickets remain and are available at www.phillycolorofcannabis.com.